Maximum grade 2%, mostly 1.5 - 1.7%. A new build and a new layout to follow, and to follow with interest. You obviously have a great start with the structures though. Nice cloud work! You should throw a couple of storms in on the horizon. 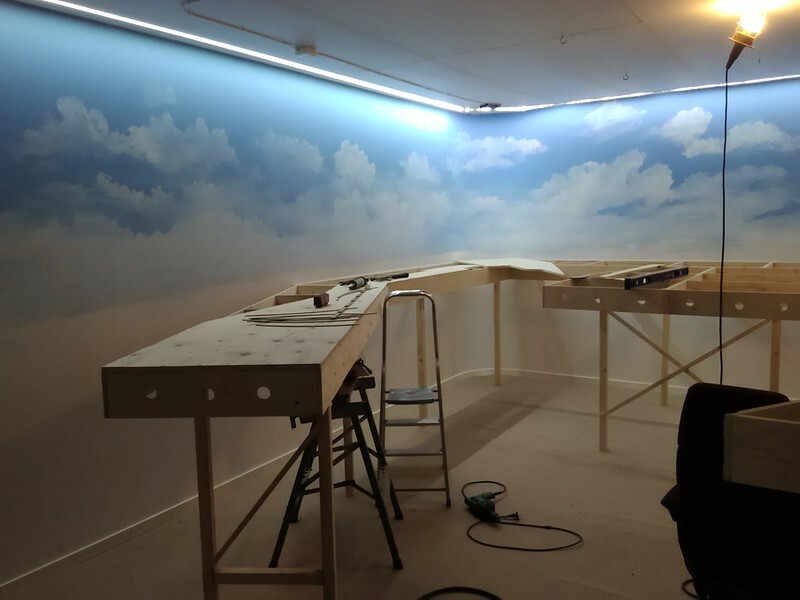 How did you paint your clouds, freehand , stencil? 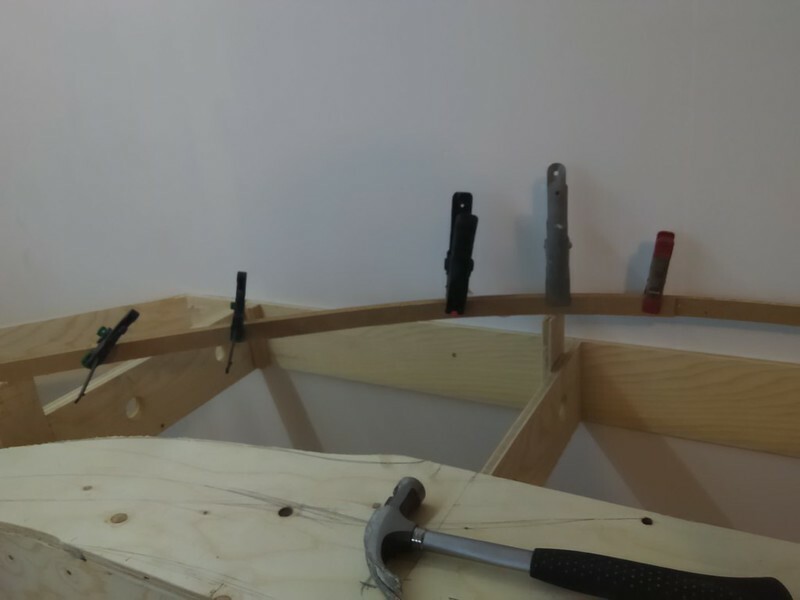 I have started the benchwork. It's 1/2" construction Plywood that I had the lumber yard rip for me in 5" widths. I have glued and nailed the modules together. The longest sections will be 8' and no one wider than 2'. That will make it easier to move if needed. Really like your plan as it has a lot of good operational opportunities! Are there going to be any passenger trains. Could be just a doodlebug to move people around. It could even drop off/pickup workers at the industries along the way. Would add a few yard tracks & also inbound/outbound tracks to roundhouse at Twin Peak. Another siding or yard spur or two at Holy Cross wouldn't hurt either. If your like most of us you'll end up with more cars than your layout can hold. Didn't see an interchange IDed in your plan. You could add a staging tray to the hidden trackage behind Holy Cross to serve that purpose. 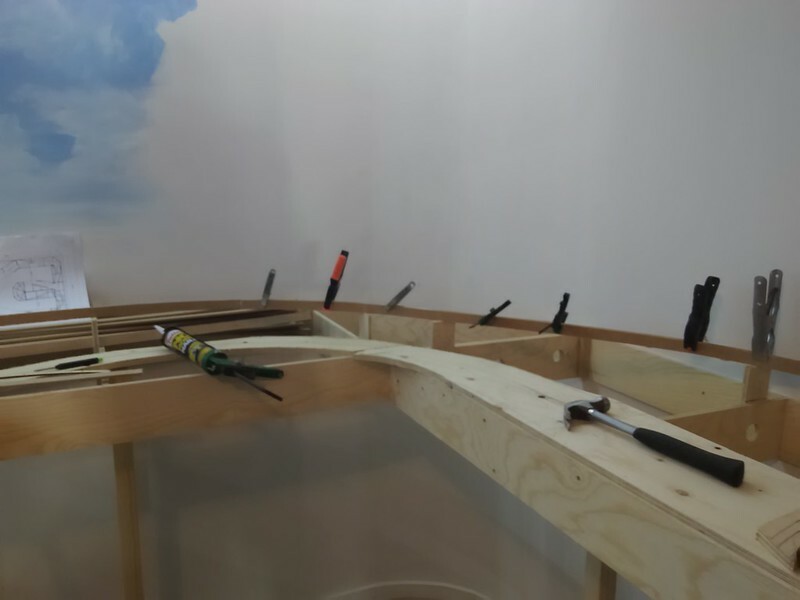 The trays allow cars to be rolled off/on the layout without having to 0-5-0 them. 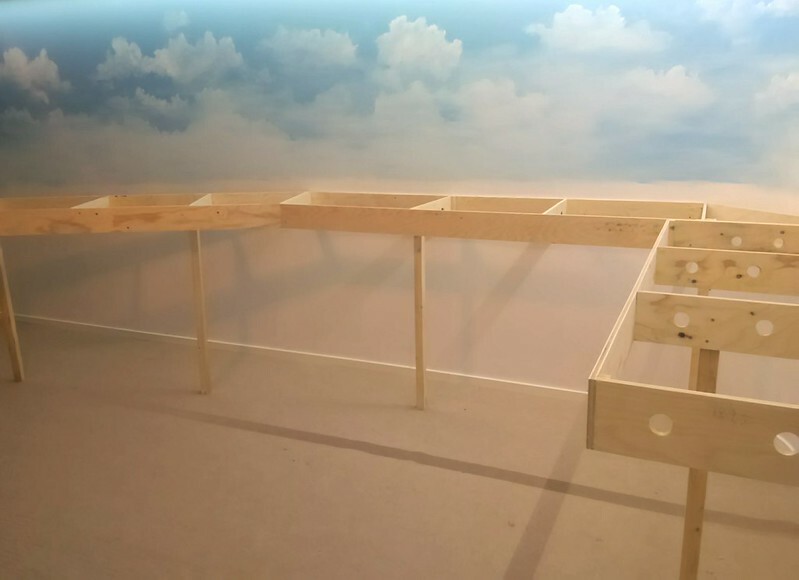 The trays can be stored under or near the layout on shelves. I realized that I have quite a lot of space to use, so a couple more tracks will probably fit. Interchange cassettes isn't planned yet, but I can install the trackwork for it. Carpet laid and trim installed. It made the room much more comfortable. Looks like a great train room! Nice layout room and backdrop. The benchwork looks very good too! The track plan for my new model railroad. 6.5 x 4.5 meters in size. 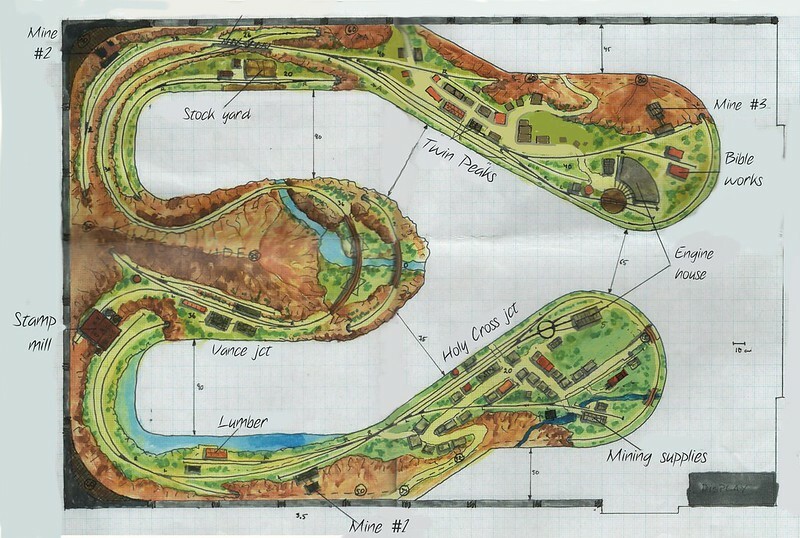 Those trackplans you draw are really impressive, they look so good. Really like the hand drawn look, you just can't get that with a computer. 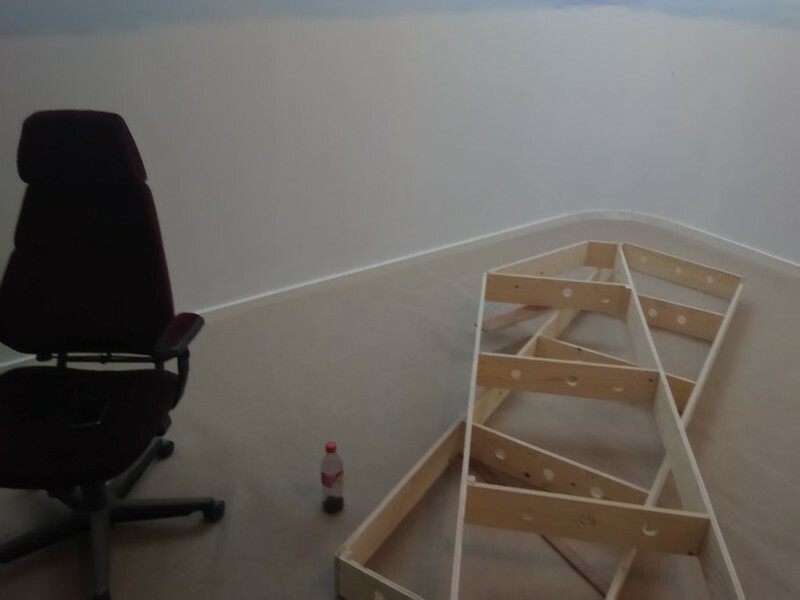 The first benchwork is up. The plywood construction makes it both light and strong. I selected to use 2x2 standing legs because if I'd used wall mounted brackets, it would have been difficult to match the wall studs. In any case it's very sturdy. I'm planning the subroadbed, and the stations, yards etc. will have 3/4" plywood. But what about the lines then? I haven't decided yet if I should use spline or ply subroadbed. 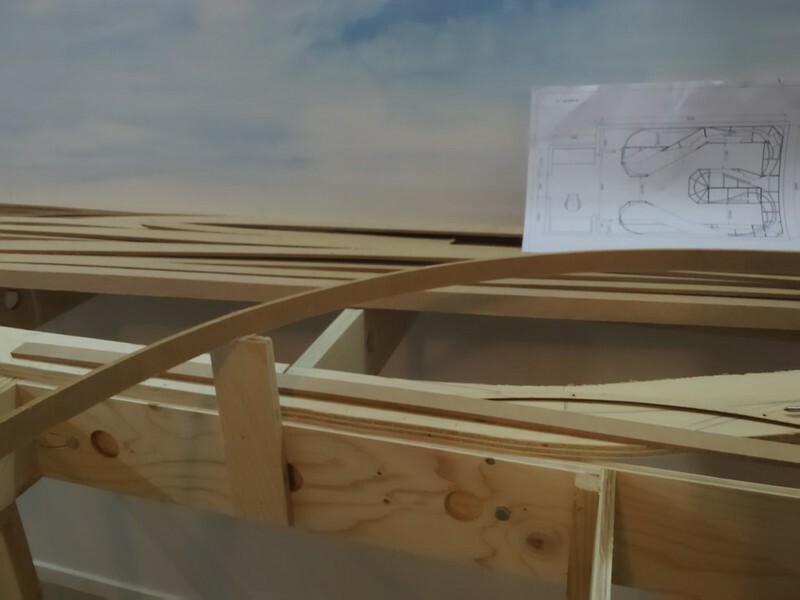 If I should build with spline, should it be 3/4" x 1/4" pine, or 1/4" hardboard? How to fasten it on the risers? 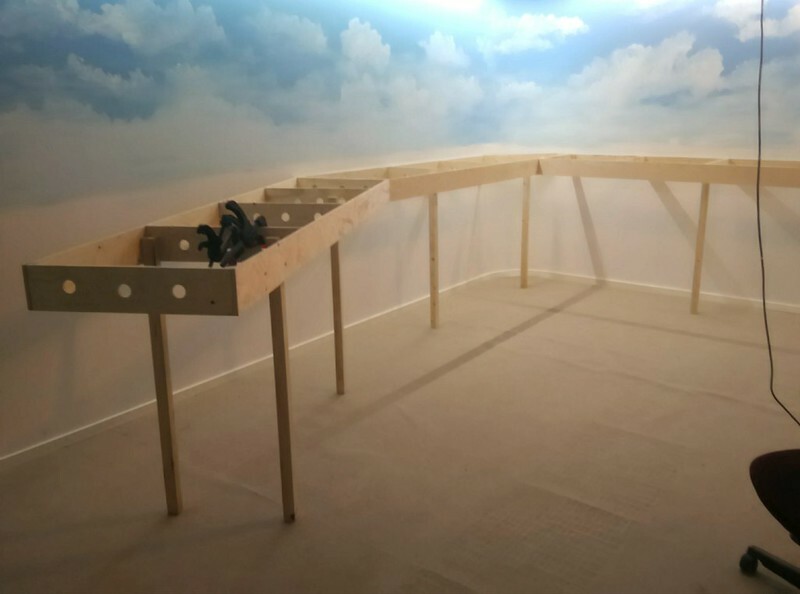 And how should the risers be constructed? 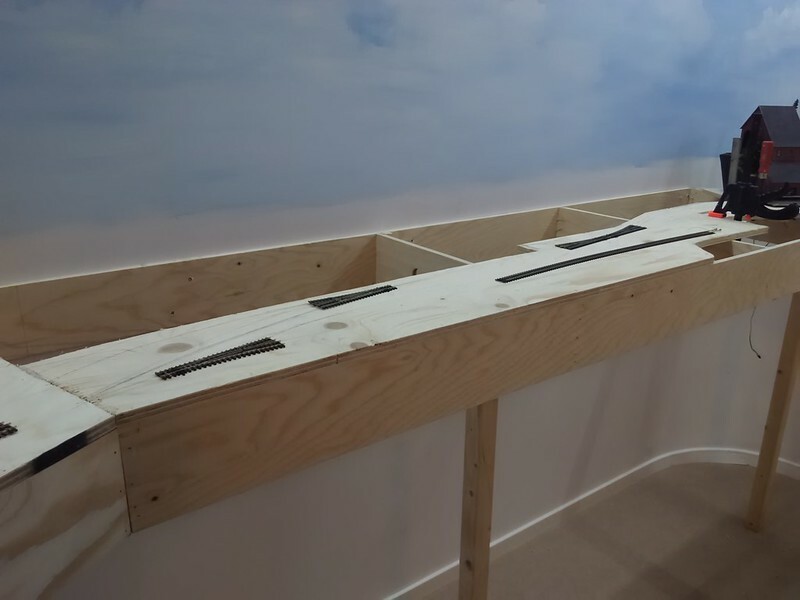 A riser can be a piece of 1 x 2, 3, 4" board, depending on how many tracks will be on top of it. That piece will be the vertical of the "T". 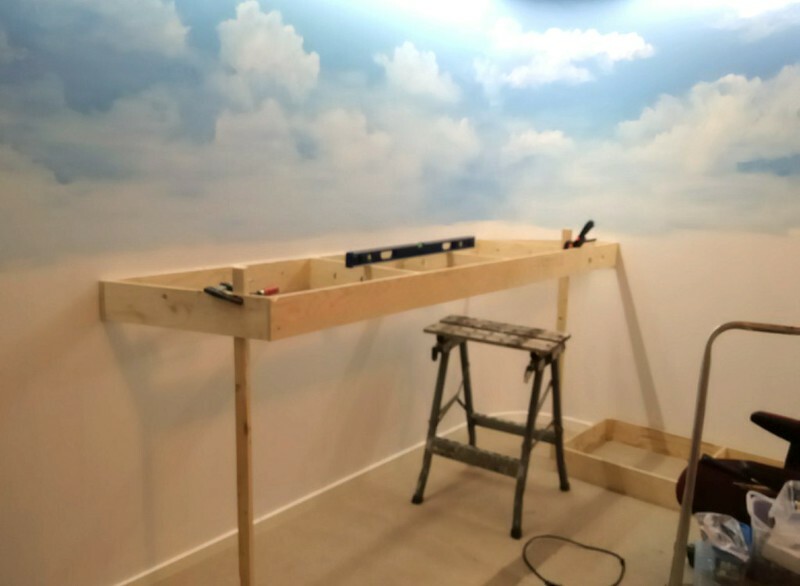 The horizontal can be a piece of 2 x 2" wood cut to fit the width of the riser. The sub-roadbed will go on top of the 2x2. I would go with wood spline myself. Prefer 3/16x3/4 for sharper curves. I have only built one layout using the open grid with risers method so I am any thing but an expert. 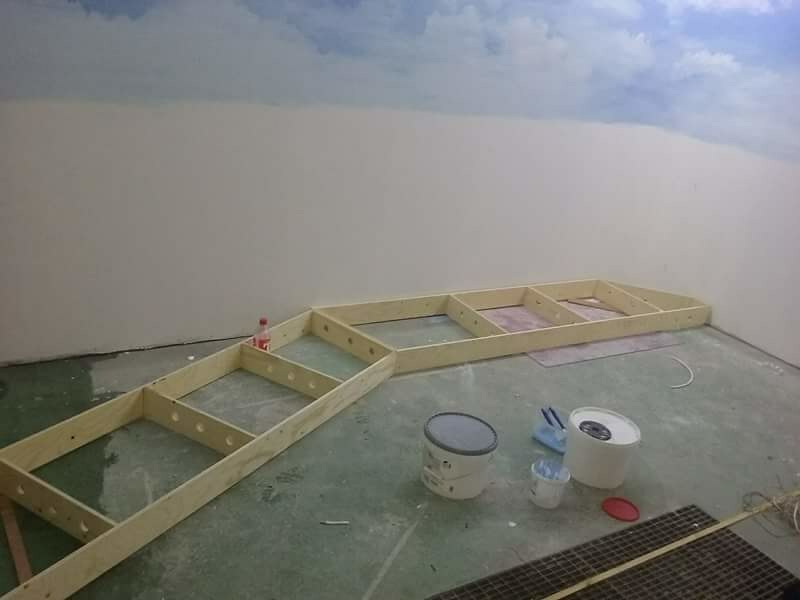 What I used though was 1" X 4" pine cut to height and screwed to the frame work then placed 1/2" (should have used 3/4") ply atop of that for the sub road bed. 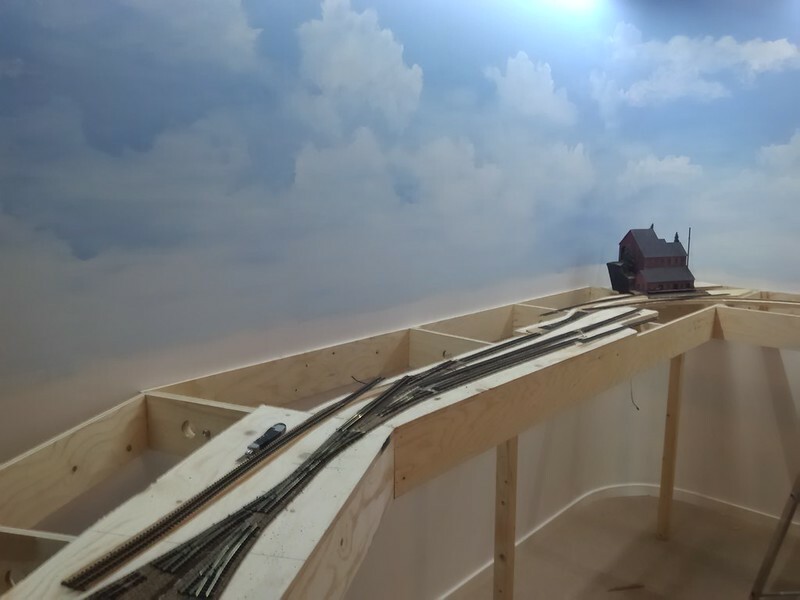 Some more progress on the layout. Almost 80% of the benchwork is ready. The ones left to do are the curve sections. I've aldo added the first 5/8" plywood roadbed. I will use plywood roadbed on the stations and yards. 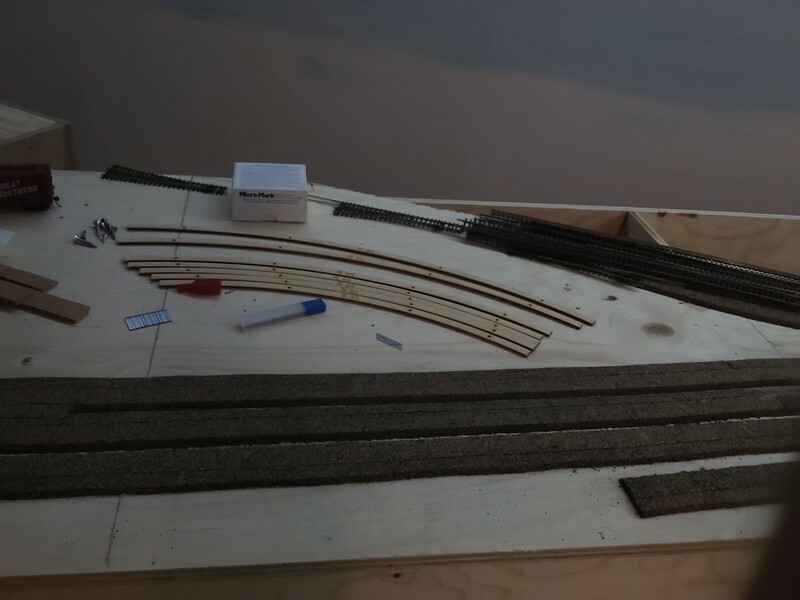 The inclines and upper tracks will be spline roadbed. Spline raw material made from1/4" MDF that I sawed into 1" strips. Tracks and turnouts. 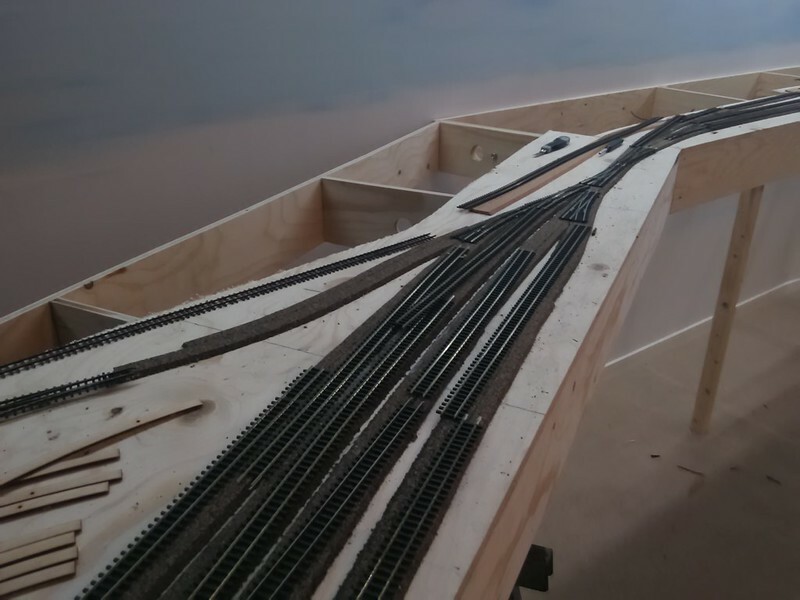 I laid out some Peco turnouts to make sure the roadbed will fit the plan. Laser cut sweep sticks for HOn3. These are invaluable! I got these made by a friend in the US. It might be possible to lay the first tracks this weekend. I've glued the cork. It's standard HO cork that I cut off a 6 mm (1/4") wide strip to make it fit HOn3 (16.5mm - 10.5mm = 6mm). Now I have to order more cork .... I need about 40-50 yards. 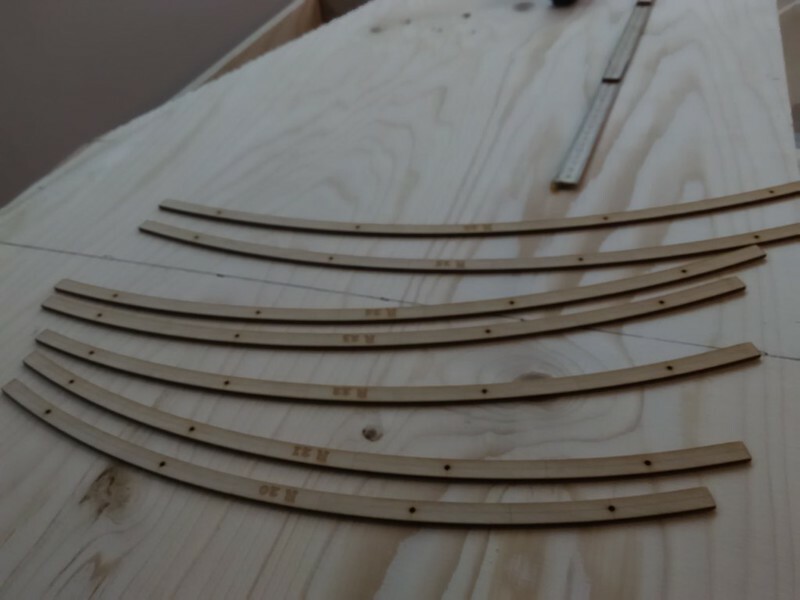 I've begun on the Spline roadbed. I'm gluing it with "No more nails" from Pattex on cartridge (I guess it's like liquid nails?). 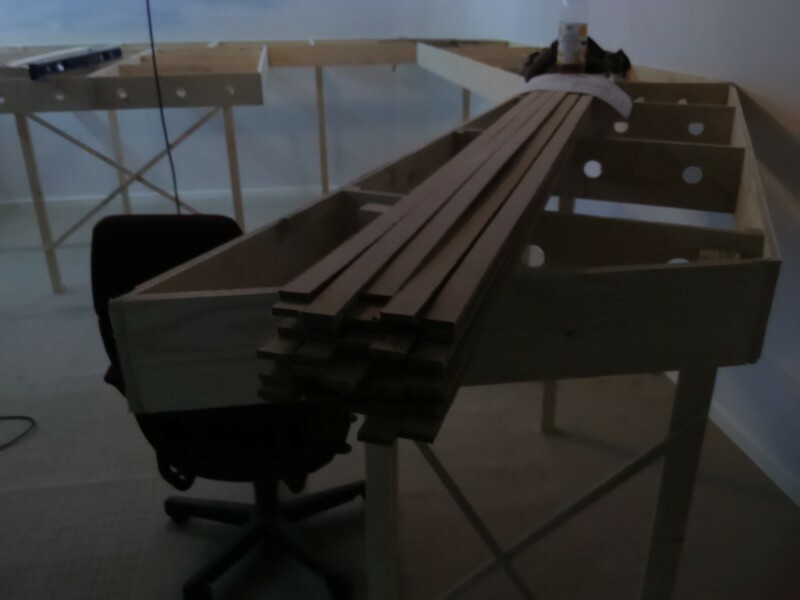 The splines are 6 mm (1/4") MDF, which is cut in 25 mm (1") wide strips. Time to make all the curved and Y-turnouts as well.